• Spend only a few hours studying and pass your Florida DMV Driving Test! • Top Choice! 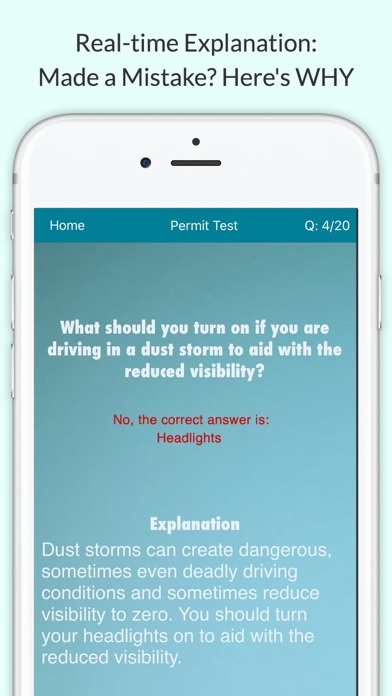 award by Appcrawlr • Featured by Apple • The latest Florida DMV test questions are available in this app • Specific for Florida (generic apps can give the ​wrong answer from a different state) Do you want to spend only a few hours studying and still pass your Florida DMV Test on the first try? This app is professionally designed specifically for the State of Florida. All the practice questions are based on the latest Florida DMV Driver's Manual. 3 test modes are available to suit​ your individual learning style. Don't waste time and money writing the Florida Class E Test again and again. 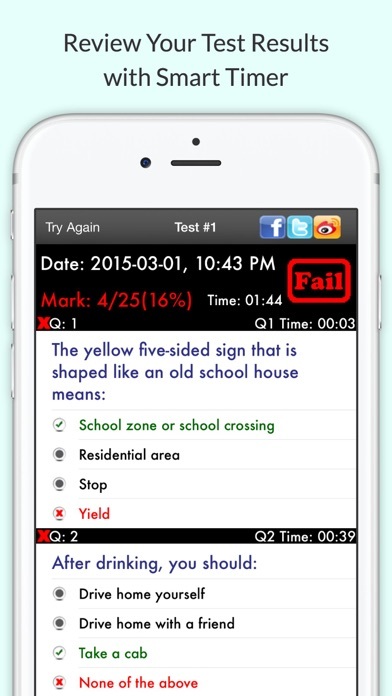 Study for your Florida DMV Test on your iPhone/iPod/iPad now! 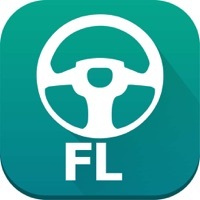 Features: • 258 Florida DMV sample test questions including 100 Traffic Signs Questions (upgrade required) • The latest Florida DMV test questions are available in this app • The questions are divided into 19 different topics, including Alcohol and Drugs, Common Signs, Lane Changes, etc • Questions are generated randomly • You can choose from 3 options: Random Questions, Incorrectly Answered Questions, and Not attempted Questions (upgrade required) • You can now track how many questions you have done correctly, incorrectly, and not attempted • Option to review all the FL DMV test questions if you don't want to take the quiz • Easiest way to get started on your FL driver's license • Simulates the 20 question Florida written knowledge test • This app works offline, no internet required • Try this Florida DMV knowledge test app for free!!! Recommendations • Recommends when you are ready to take the test • Professional analysis using binomial distribution • Analyze your chances of passing the actual knowledge test based on your past performance • Gives you the probability of passing the actual knowledge test and tells you how long before closing you should go take your exam Test Result • View your test results • Find out what questions you've done wrong after taking the test • Displays the time used for each question, answer chosen and correct answer • Explanation for every question you do wrong Track Past Test Results • Past test marks will be graphed so you can see your improvement • Individual tests will be listed with pass or fail and your mark • Shows your highest, average and lowest mark and time used Support • Send question feedback directly from the app • Join facebook page • Visit our website Smart Timer • Track how long it takes for you to take this test • Intelligent timer will stop when you put the app to sleep or viewing the answer Track your progress • Right and wrong counter built into the test *Disclaimer: This app is for general information only. Nothing in this app is intended to provide legal advice or to be relied on as binding in any dispute, claim, action, demand or proceeding. Very helpful while studying for the written test should be able to pass the test the first time taking it. Excellent... it’s very helpful. You can memorise everything. Easy and simple. Cheers! It’s a really good app, very helpful. blindly recommended ! Amazing app with great explanations. 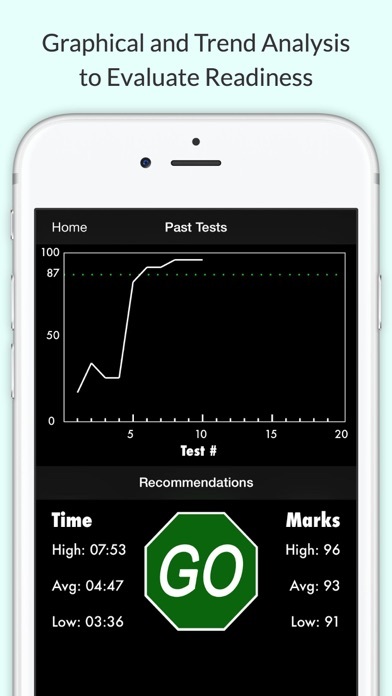 I’ve been reading the manual and using this app for studying and I’m pretty sure that I’m going to pasa the test! This is helping me to get ready and study my permit test. 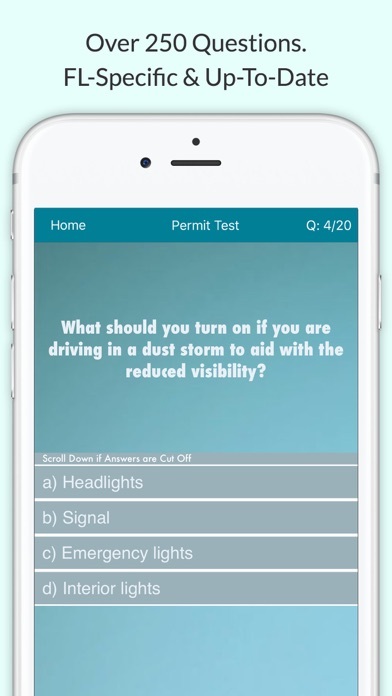 Fun app and very useful .. makes me pass the test over and over again easily .. I'm sure when the real tests happens I will pass with flying colors !! THANK You !! 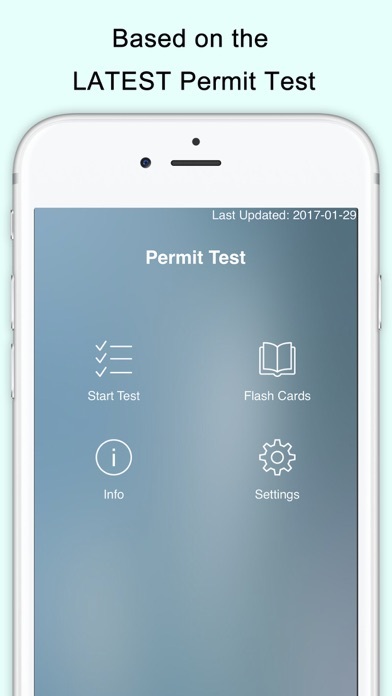 Practicar con esta App es garantía de aprobar tu examen para obtener la licencia de manejo en el estado de Florida! Excelente! So helpful for taking the test! Very helpful! Practiced and studied hard and passed the test! I can study anywhere and that a bonus! Thanks for the questions the full app is what I purchased and it was really great not to mention i took the actual Florida written test and only got 3 wrong. 100% recommend this app. This app is great for studying what you don't know before taking the test !! A good tool guide and very helpful! Great app, seriously helped me so much!